This new Star Trek definitely has potential and its lead actress, Sonequa Martin-Green, is totally engaging to watch. If the quality from the first two episodes is any indication, and assuming it persists, audience will be in for a treat. The show has a gorgeous cinematic quality to it. From the top rate CGI (much better than most shows on TV) to the beautiful cinematography (by Guillermo Navarro) and great scoring (by Jeff Russo). 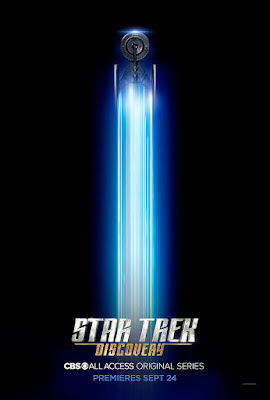 Creatively, the showrunners (pity Bryan Fuller has left), took a bold risk to start the series off with a prologue-esque structure, focusing on a lead that was not a captain of a Starfleet ship. This definitely informs the character and establish a relationship between her and the audience that will likely shape the rest of the season. However, all shows - and especially a Star Trek one - are ensemble series, and we will have to wait for Episode 3 to see how the full cast get on together and essentially whether the cast can sell the show to non-trekkies. But from these two episodes, it might be worth the wait to check it out for a few more episodes at least. Welcome to the second pilot. Or the official one. And welcome Jason Isaacs. He is an enigma isn't he? Do we trust him? Or do we not? Now that is great character-writing. On the other hand, Anthony Rapp just comes off as rude, stucked-up and condescending with nary a redeeming factor. Hopefully that changes, we won't want our first openly gay Star Trek character to be a stereotype now do we? But the breakout star - together with Martin-Green, who continues to impress here - is Mary Wiseman. She has a warmth and humour that did not seemed forced or scripted. Looking forward to more pairings between her and Martin-Green. Although after this episode, it does kind of look like this series might follow in the lead of Doctor Who, not just for the whole stuck in space / horror in space / alone in space concept. but it might jus be a case-of-the-week procedural type series with its central mythology weaved in and out. Rather than a straight up serialised sci-fi. Only time will tell.